Anxiety disorder can disrupt your daily life. It is estimated that nearly 6.5% of the world population suffers from this disorder. Anxiety disorders aren’t just a case of “nerves.” They are illnesses, often related to the biological makeup and life experiences of the individual, and they frequently run in families. It is a debilitating and scary condition which causes its sufferers to retreat and hide both physically and emotionally. There are several types of anxiety disorders, each with its own distinct features. An anxiety disorder may make you feel anxious most of the time, without any apparent reason. Or the anxious feelings may be so uncomfortable that to avoid them you may stop some everyday activities. Or you may have occasional bouts of anxiety so intense they terrify and immobilise you. Anxiety dis orders are the most common of all the mental disorders and can affect all ages, including teens and children. Anxiety attacks can cause such physical symptoms as sweaty palms, dizziness, and diarrhoea or intestinal/digestive discomfort, a feeling of having a lump in the throat, insomnia, and restlessness. This list is far from inclusive of the physical discomforts that excess anxiety can bring about. There may be feelings of uncertainty, uneasiness, or apprehension related to the unknown. One may experience a racing heartbeat, feeling of tightness in the chest, rapid breathing, or tingling in the hands and feet. The physical effects of anxiety accrue over time, and can lead to anxiety disorders. A state of long term anxiety can be dangerous as it can eventually wear out the body, as a result of anxiety and its effect on the immune system and glandular system. 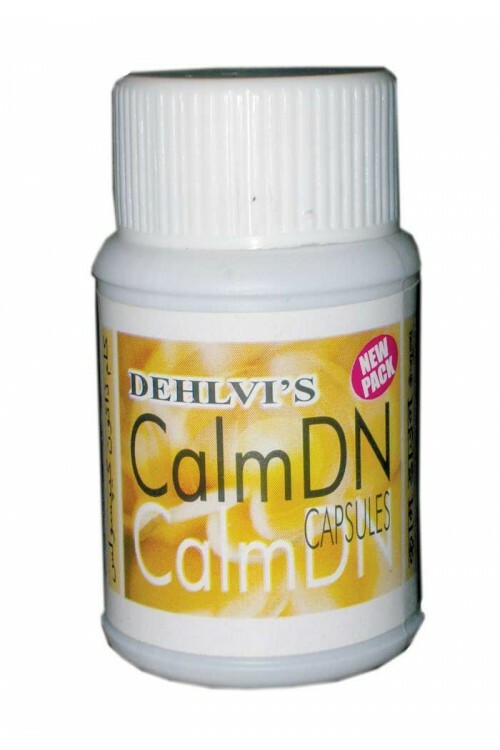 Calm-DN reduces chronic and nervous anxiety without any side-effects. Contains herbs that help with stress relief by supporting the adrenal glands, brain and metabolism to overcome the accumulation of biological stress. 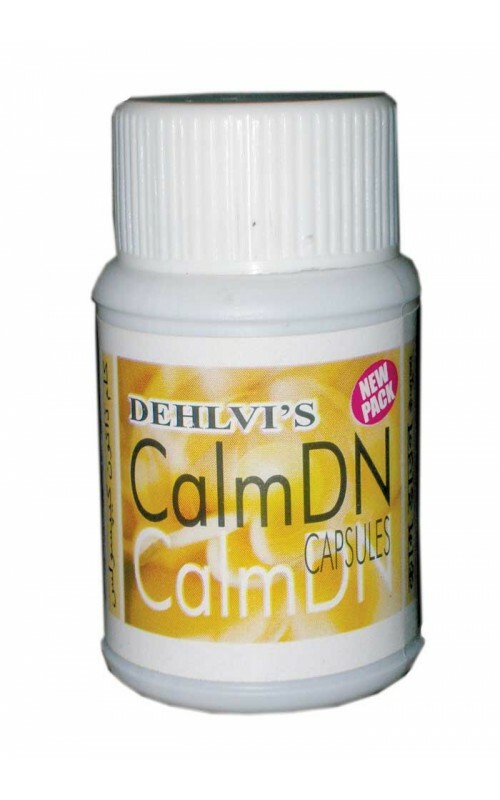 Calm-DN restores mental peace and induces natural sleep. Also restores coordination of body and mind. Chronic and nervous anxiety, generalized anxiety disorder (GAD), panic disorder and agorophobia, social anxiety disorder, behavioural disorders, emotional disturbances, anxiety associated with depressive symptoms, insomnia, irritability and hyperactivity and aggressiveness in children. 1 or 2 capsules twice daily after meals with water. Children above the age of 6 should be given 1 capsule twice a day. Continue use of this product at the recommended dosage as long as the above mentioned indications are obviously present. As symptoms subside, begin to reduce dosage accordingly. Maintain product use for some weeks even if no further symptoms are present. Do not exceed recommended dosage. Centella asiatica (Brahmi) 50 mg.
Lavandula stoechas (Dharu) 50 mg.
Piper nigrum (Kali Mirch) 50 mg.
Evolvulus alsinoides (Shankapushpi) 50 mg.
Rauwolfia serpentina (Chota Chand) 300 mg. Pack size: In packs of 28 Capsules. Avoid caffeine, alcohol, carbohydrates, chocolates, sugar, sweets, orange squash, refined foods, and cut down on foods that are known to cause allergies (common food allergens are dairy, soy, citrus, peanuts, tree nuts, wheat, fish, eggs, corn, food colourings, and additives). Fresh vegetables, fruits, whole grains, and protein nourish the nervous system, so eat more of these. Regular aerobic exercise boosts mood - enhancing brain chemicals and encourages relaxation.